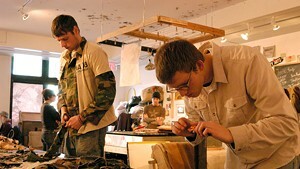 The nationally known art initiative Combat Paper Project first launched at the Green Door Studio in Burlington's South End in 2007 and is now based in San Francisco. Cofounder and Iraq War veteran Drew Cameron returns to New England this weekend with a pair of workshops at Dartmouth College. CPP uses traditional paper-making processes to transform military uniforms worn during service into paper art. Cameron leads free and open-to-the-public paper-making workshops in Room 60A at Dartmouth's Hopkins Center for the Arts on Saturday, January 24, and Sunday, January 25, from noon to 5 p.m. On Monday, Cameron gives a talk titled "Artists Respond to War, Part 1," in Room 219 of the college's Wilson Hall. Civilians and veterans alike are invited to join; workshops are run on a drop-in basis, and participants can come and go as they please. Cameron now frequently travels around the country for such projects, teaching paper making and giving talks. The process of the craft, he pointed out, is inherently cathartic: Combat uniforms are beaten to a pulp to make paper. “It is literally transformative,” Cameron said. “You’re transforming the physical state of the textile into paper, and we can use that as a lens to look at other things that are occurring. Paper also has the longstanding state of being a place to record information. The results of that creative process are often visually evocative. 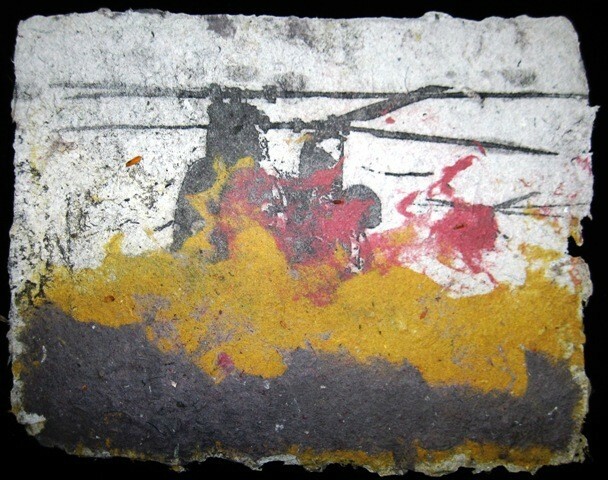 In a 2009 story about a Combat Paper Project exhibit in the Firehouse Gallery (now BCA Center) in Burlington, Seven Days reviewer Kevin J. Kelley noted the "raw, ritualistic quality" of the works. Cameron was an artist before he was a soldier. A New Hampshire native raised in Iowa, he first learned traditional paper-making techniques from his father, a retired air force officer. But Cameron's early adult life initially took him away from the craft: Right out of high school, he enlisted in the U.S. Army, and served from 2000 to 2006. That period included four years of active duty in Iraq as an artillery field soldier, and two years in the Vermont National Guard. In 2004, while pursuing a degree at the University of Vermont, Cameron found his passion for paper making rekindled under the guidance of Drew Matott, a paper artist working out of Green Door Studio. Cameron became managing director of the studio in 2006, the year that he hit upon the idea of making pulp from former combat uniforms. "There is a longstanding tradition of having an artistic response to military conflict, both by those who have survived it and those who have participated it," he said. "We’re continuing to stand on the shoulders of those who have come before us."